This amplifier review was originally intended as a Christmas stocking filler review, unfortunately I was out of reviewing action with a family illness and the review was delayed. Now I am back and slowly working through the backlog of reviews. Here we have an amplifier from Sure Electronics based on the Tripath TA2024 chipset. Also used in this implementation is rotary encoder for the volume control with a digital volume control IC. The fit and finish of the packaging is excellent, a nicely machined and anodised aluminium case with a large volume control knob. When powered on the gap around the volume knob is illuminated to provide a neat indication the amplifier is on. On the front the only other control is a toggle switch to power up the amplifier. There is no input selection as there is only one set of inputs on the rear. Also on the rear is a set of loudspeaker connectors, no WBT clones here as there is little free space, just a simple, slim set of 4mm binding posts. 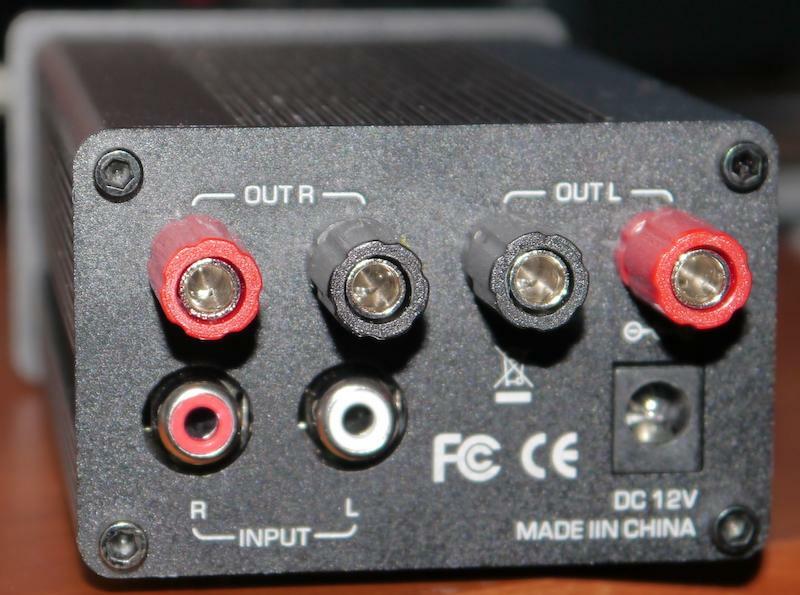 You could use spade connectors on the speaker cables but I would stick with 4mm plugs to avoid any possibility of shorting the outputs as the connections are so close together. Also supplied with the amplifier was one of the usual brick style, switched mode power supply, this is an additional cost raising the total price to a heady $50. As the supply is 12v this amplifier is ideal for powering from a 12v battery or simple linear supply. I started out using the supplied power brick that gives a low cost and neat setup. I did explore the benefits of a battery supply as I am sure you would like to know the impact? I have a small collection of class D amplifiers, my first was a Trend TA10.1, one of the early favourites with a similar specification to the TA2024 from Sure Electronics. I also have an Amptastic Mini 1 from the UK that is slightly larger in size with a better finish. The collection includes a home assembled power amplifier based on a pair of 200W class D modules that use the International Rectifier (IR) chipset. This home assembled amplifier is not really a fair comparison as it is so much more powerful and has no pre-amp/volume control. I use my MFA Classic for this duty, making a significantly more expensive combination. The speakers for this review are a pair of custom Demand Better Audio Envy 3, a 3 way design based on carbon fibre spheres fitted with some excellent drivers. These speakers respond well to class D amplifiers and in my experience are a better match than with exotic valves or regular class A/B amplifiers. My regular setup uses the Envy 3 speakers with the MFA Classic pre-amplifier and the IR based 200W amplifier, a very nice combination. The Sure Electronics TA2024 turns in an excellent performance straight out of the box. The volume control is the most obvious difference, the majority of amplifiers use a commonly available variable resistor or perhaps a stepped attenuator that turns through about 270 deg to change from zero to full output. The TA2024 uses a digital volume control operated via a rotary encoder attached to the volume knob. This seems to operate with every step giving a small volume change and as there is no physical end stop the knob rotates through more than 360 deg. This feels very different in operation and you feel as though you are turning the volume a very long way. Once you get used to the volume control the TA2024 is nice to use and as the fit and finish are very good it looks the part. As with all these small amplifiers, the Trend and Amptastic are the same, they are so light that as soon as you attach input and speaker cables the amplifier is unstable and needs a weight on top to hold it in the desired position. If you are using chunky speaker and input cables this is a real problem, a significant weight will be required. Alternatively you need to dress the cables so they appear at the right place to connect to, and exert no force on, the amplifier. The Sure excels in the mid range and high frequencies with a delicate and detailed presentation in my setup. It drives the DBA Envy 3 with ease and with more than enough loudness. I still get complaints from my good lady that the music too loud! The low end of the musical spectrum is still very good with excellent rhythm and timing. The Sure sounds lighter in weight than my more powerful amplifiers. It is a different presentation more than a failing of the Sure and very enjoyable. Compared to the other Class D/T amps in my collection the Sure is very similar to the Trend and Amptastic. They should be similar as they all use the Tripath chip sets, although of different generations. The Amptastic uses better quality connectors and is a more practical design though it is much more expensive. The Trend is similar in build quality and sounds a little rougher compared to the Sure, not surprising as it is a few years old and uses an older design chipset. The Sure performs well with all genres of music and whatever source you want to use, I have tried it with vinyl as well as digital using the regular front end sources (AP-Linux PC feeding La Voce mk1 DAC and a Pre-Audio ASP1501 turntable with Benz Micro wood cartridge). Compared to the International Rectifier (IR) home assembled amps the Sure is a bit sweeter and more delicate in the high frequencies but looses out in the bass with weight and drive. This is to be expected as Sure is a much lower power, and cost amplifier. The IR amps are paired with my MFA pre-amp that on it's own costs many times more than the Sure TA2024. I did use the TA2024 with a battery, a 2.2Ah 3 cell lithium polymer packs and it worked very well. A fully charged battery lasting several hours, and the results are good though to my ears not worth the inconvenience of having to remember to recharge the battery after every listening session. The background is perhaps a little quieter and the high frequencies a tad smoother, for me the differences are very small and not worth the hassle. Paired with suitably sensitive speakers the Sure TA20124 is a very good amplifier and exceptional value for money. Sometimes I wonder if my valve amplifiers are really that much better when you consider the purchase price and operating costs (electricity and replacement valves). The class D/T amps are now really coming of age, they sound good and offer low running costs. There will always be those who prefer the behemoths, the hot and expensive class A valve and transistor amplifiers, that are increasingly expensive to own and run. 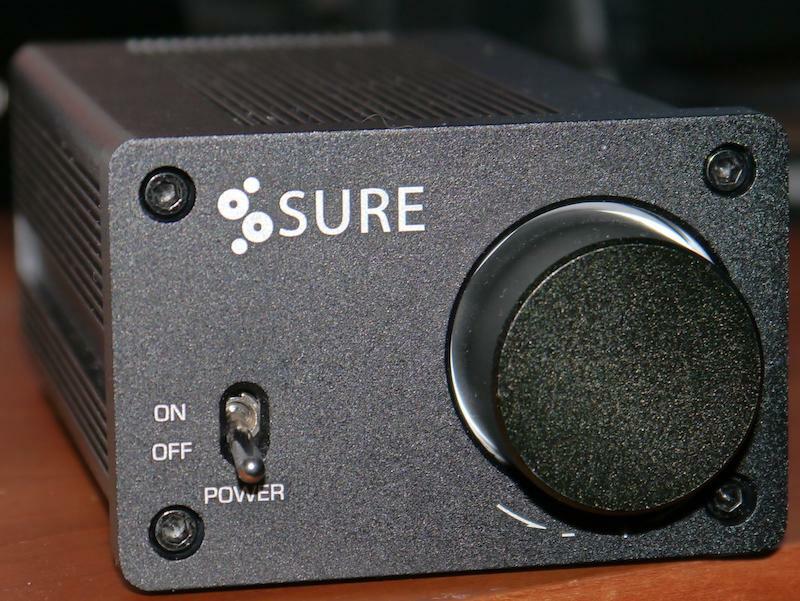 The Sure is a very good amplifier for a second system, perhaps for a desktop fed from a similar priced USB DAC and small pair of speakers in a near field setup. The Sure deserves better as it sounds so nice and sweet, the only thing holding it back is the physical layout and number of inputs. Put the TA2024 in a larger box along with the PSU and more inputs and you really would have a great main stream amplifier with the right speakers. At the price I have heard nothing else that comes ready made and sounds so good, the Sure TA2024 is exceptional value for money.